Taisy system, Lonetrek region. On the 17th of October at 10:00 EVE Standard Time, forces belonging to Project.Mayhem. [16-13] and their allies clashed with Circle-Of-Two [CO2] in the system over a tower. In what has become a habit, Project.Mayhem. forces reinforced a Circle-Of-Two tower, this time in the Taisy system to draw a fight out of Circle-Of-Two. When the tower was set to exit its reinforcement mode, Project.Mayhem. had organzied a 50 pilot Machariel Battleship fleet with Triage Carrier support and jumped into the system through the Nalvula gate. Loading grid, they were welcomed by Circle-Of-Two’s 70 pilot Ishtar Heavy Assault Cruiser fleet waiting at 80 kilometers from the gate. Thus the battle started. Project.Mayhem.’s fleet quickly anchored on the gate and started firing on the Ishtars, who evaporated to the artillery barrages of the Machariels. 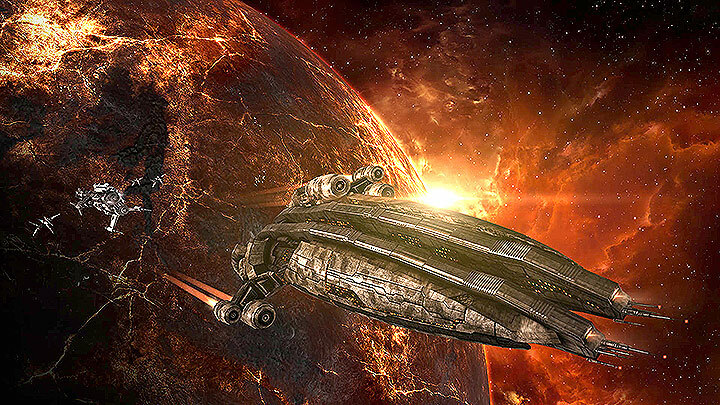 Attempting to return fire, the Ishtars found the mainline ships of the Project.Mayhem. fleet were able to soak the damage, thanks largely to the 2 Triage Carriers present. Thus, in order to remove the Triage support, Circle-Of-Two lit a cynosural beacon on top of them and ushered in 4 Dreadnoughts who quickly obliterated the Carriers. Project.Mayhem. quickly switched primaries to the Dreadnoughts, managing to take down 3 of them while jumping in another Triage Carrier. Unfortunately the third Triage Carrier went down as well, and a fourth one had to be brought in just as the last Dreadnought for Circle-Of-Two was destroyed. At this point with only 1 Triage Carrier and trouble soaking the damage due to low Logistic ships numbers, Project.Mayhem. decided to concede the field. Once its Triage Carrier jumped out of system, the rest of the fleet de-aggressed and retreated back to the Nalvula system. Circle-Of-Two forces having won the battle retreated to their tower, unaware that Project.Mayhem. were merely re-organizing and bringing reinforcements. A Snuffed Out [B B C] Machariel force came to bolster the Project.Mayhem. fleet, numbering at 20 pilots. With a new Triage Carrier the Project.Mayhem. force warped to the tower at close range, with Snuffed Out forces awaiting in the nearby system, ready to be called in. The Circle-Of-Two force decided to once again take the fight, perhaps emboldened by its previous victory. After warping to a perch above the tower it landed 30 kilometers away from the Project.Mayhem. force. It was the moment the Snuffed Out reinforcements were waiting for. Quickly, they entered system and warped on top of the Ishtar fleet. A quick fire exchange occurred with Project.Mayhem. and its allies decimating the Ishtar fleet and forcing it to retreat. With Circle-Of-Two forces in retreat, the tower is quickly destroyed and Project.Mayhem. forces log off in the system for the scheduled server maintenance time. Once the server was back up again, the Project.Mayhem. fleet reformed, and continued to clear anchored modules which belonged to the tower. At this point Circle-Of-Two forces return to the system once more, having re-shipped and re-formed their fleet to an 80 pilot Machariel fleet, along with Triage Carrier support. The force warped nearly on top of the Project.Mayhem. fleet and the two sides begin to brawl once more. Snuffed Out forces returned as well and lent help to the Project.Mayhem. fleet. At first the two sides traded ships, losing Battleships and Triage Carriers. Yet, as the battle drew out, the Circle-Of-Two’s fleet was the one getting ground down. Project.Mayhem. and its allies quickly switched their guns from artillery to auto cannons, leveling the playing field but adding Energy Neutralizers to their Battleships. Fighting in almost point blank range, the Project.Mayhem. Machariels were able to quickly drain the capacitor of the Circle-Of-Two Triage Carriers, shutting them down. Without Triage Remote Repairs, the Circle-Of-Two Machariels simply melted in the close range inferno that the Project.Mayhem. fleet unleashed on top of them. In a few minutes, the Circle-Of-Two fleet was forced to withdraw, abandoning its remaining Triage Carriers and allowing Project.Mayhem. to once again claim victory. After destroying any remaining modules and extracting their Triage Carriers, the Project.Mayhem. force extracted safely, allowing Circle-Of-Two to claim the moon once more and secure a strategic victory, at the cost of a tactical defeat. The Battle from the PoV of Project.Mayhem. Triage and Support. Battle report for the Taisy system can be found here. All told the battle on its various parts lasted approximately 1 hour, with less than 200 pilots in system and no Time Dilation reported as a factor in the fighting. Project.Mayhem. and its allies lost 4 Carriers and 5 Battleships, along with other support ships reaching 21 losses for 15.58 Bil ISK of damage. Circle-Of-Two lost 4 Dreadnoughts, 3 Carriers, 24 Battleships and 11 Heavy Assault Cruisers. All told its losses numbered at 84 ships and 34.53 Bil ISK of damage. Let me guess.. Imperium suffers a HEAVY BLOW again ? Even though the 2 top pvp corps left c02 -itai and blck scorp – they still have enough rich n stubborn serbs and a dedicated us tz to take these fights…they have the money moons in their sov the low secs stuffs is just padding, real money lies in c02s space so they can fund to be bad until enough bads get the objective done….not bad kill report since only half the serbs every shoot the primary ..gigx would win more fights if his own peeps did what he said. fast! What web host are you using? Can I get your associate link for your host? Leave a Reply to Fermin Click here to cancel reply.